It’s estimated that one in seven couples will find it difficult to conceive due to infertility, and while some people may choose medical intervention to increase their chances of conception, many others like to opt for a more natural route and adopt some lifestyle changes such as a change in their diet. Natural health experts often suggest that following an anti-inflammatory eating plan can increase fertility rates, and improve implantation; the pineapple is one such food that is believed to increase the chances of conception. And while there is plenty of anecdotal evidence on the internet from women who say that they believe eating pineapple has helped them, it should be considered that there is no scientific evidence to support this. The theory is that due to the aspirin like qualities of bromelain contained within pineapple, it can help to reduce inflammation; this might make pineapple a useful aid to women that suffer from conditions like PCOS, which can make it difficult to conceive. In addition, due to the blood thinning effects of bromelain, it is also believed that this will help to improve the blood flow to the uterus. It is crucial that women consume pineapple at the right time of the month. Natural fertility sites advise women to steer clear of it in the run-up to ovulation as it can have a negative impact, and it can also cause contractions, which might be harmful to the chances of implantation. Not taking pineapple alongside blood thinning medication such as aspirin because it might increase the chances of a miscarriage. It is advisable to eat organic pineapple when you can to avoid exposure to excessive chemicals. Before making any changes to your diet, is essential that you seek medical advice first as the bromelain in pineapple can interact with some medications. If you are hoping to conceive, discuss any plans you intend to make to your diet with a medical expert first. Polycystic Ovary Syndrome is believed to affect up to one in five women in the United Kingdom. Symptoms can include hair growth, acne and weight gain. PCOS can also cause fertility problems. Because of its powerful anti-inflammatory action, pineapple has been suggested as a treatment for women suffering from PCOS. Indeed, there are many accounts online from women who have noted an improvement in their symptoms as a result of including fresh pineapple in their diets. And some women with PCOS have reported a reduction in a facial hair after regularly consuming pineapple juice. 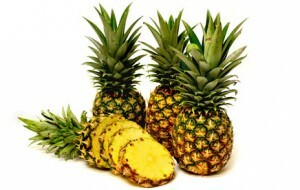 Experts recommend eating pineapple up to five times a week for maximum effect. This can be consumed as juice, as a smoothie or on its own, but for the best effect it should not be tinned.